I’ve been listening to a bit of Children of Bodom lately, and a couple of years ago I had the pleasure of reviewing an ESP Custom Shop Alexi Laiho model guitar which melted my mind (actually I should put that review on the site – it was an amazing guitar). Alexi’s choice of passive EMGs is a bit controversial as a lot of players are so used to active EMGs that they consider the passive ones to be lesser pickups, but I’ve tested them in about a dozen guitars now and have been consistently impressed by their unique growl. So when EMG announced an Alexi signature model, my first thought was ‘freaken sweet!’ Now you can buy that model in a set with a unique gain boost which adds further flexibility to the pickup. 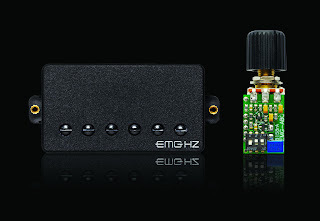 EMG, Inc. has released The EMG-ALX with ABQ EQ/Boost — the new Alexi Laiho signature model. This is a newly designed EMG passive model — custom wound — and includes the new ABQ EQ/Boost which features a push (to activate) / pull (to deactivate) control. The ABQ has a 3 band EQ which can be adjusted for creating different tone settings. The boost output can be adjusted as well to add or subtract gain. For more information, visit their web site at http://www.emginc.com/.